Looking for high octane action that's vibrant and never takes itself seriously while being set in Feudal Japan? Then look no further. This is the anime for you. Looking for a deep engaging plot that forces your mind to ponder? Sorry, not this time. Sengoku Basara is for the action fans. Pure and simple. Over the top is the name of the game here and for anyone who has ever watched Gurren Lagann, that's just how over the top we are aiming. 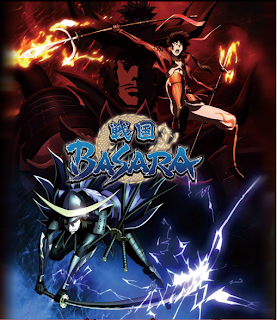 A few examples including one of the main characters wielding six katanas and flying through the air with slashes creating lightning, the other main character wielding two long spears that ignite in flames, a general stands upon two horses that literally run up a vertical wall, a female ninja that practically goes into orgasms from her general just looking at her a certain way, explosions from melee weapons, falcon punches, and whenever the main villain arrives, a storm cloud and epic music follows every time. Did I mention that one of the main characters rides a horse that might as well be a motorcycle? That's right. Handlebars and mufflers. In the Feudal era. It has its charms and it has its flaws but ultimately it does what it sets out to do. Even though I would prefer a decent story, it's a fun ride and it's only twelve episodes so it isn't a big investment or anything. It's just a fun little series with samurai, ninja, and feudal lords fighting for supremacy of the land. As almost always we have Oda Nobunaga as the main villain. That's right, the characters are named after real people. It's kind of like Dynasty Warriors but for Japan instead of China. Actually, that's exactly what it is because this anime is based off the game with the same title that is exactly what I just described. Hence the reason there is very little story. It's based off of a hack and slash video game. It even tries to develop the characters further than the game's counterparts while having all of the same voice actors from the game. Which is good news because these voices fit like a glove. So that's a relief for sure. There's a huge diverse cast here to enjoy and each has quite the elaborate character design. So I think you get the idea already if you're going to like this or not. If you do like it, watch it now. You've got almost two weeks before the next season starts. That's right, season 2 is coming out because this show did well enough during its first run. It's one of the many shows I'll be reviewing for the summer season. In the infamous words of Date Masamune, "PUT YOUR GUNS ON!" Decklist Ex Machina #1: Branch Panch! Wicked Anime Reviews #2 Nyan Koi! D&D 4th Edition and why you should try it.